If this is the first time that you are burning a pan, there is no need to feel ashamed or embarrassed because you are not the only one. Everyone has one of those lazy days when you forget to check on the food left on an open flame. Of course, you must always try to salvage as much food as you can, but there is only so much that you can do. The method that you use to clean your burnt pans can vary depending on the kind of pan and the level to which you have burnt it. 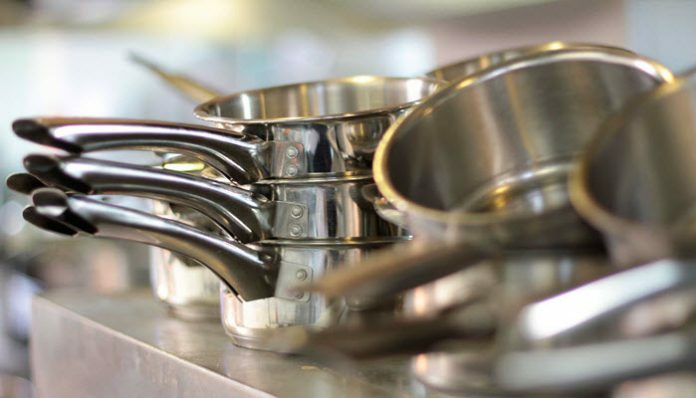 Check out these 5 ways to clean burnt pots and pans. Whether it’s grease or burnt milk, leave the pan soaked in salty water overnight. You can boil the same water in the pan the next day. Don’t forget to scrub the pan gently. If you are looking to do something fast and quick, just sprinkle some salt on your burnt pans and let it settle on it for about 10 to 15 minutes. Scrub your pan right after and the stain shall come right off. Either use a plastic or rubber scraper, particularly if you are using non-stick pans. When it comes to cleaning cast-iron pans, just sprinkle salt on the hot pan and scrub it off with a stiff wire brush. After that, just wipe off the scrubbed soot and store your cast-iron woks away with a coating of vegetable oil on them. Vinegar is the ultimate savior in lots of cases involving aluminum utensils. You can either boil a vinegar and water mixture in your burnt pan to loosen the stains or just let a few cups of vinegar rest in the dirty burnt pan before rinsing it off with warm soapy water. A mixture of baking soda and vinegar with water is also effective for removing stains off non-stick pans. All you need to do is let this mixture boil in the pan for a while before washing it off in normal water. Over the years, detergent has also been proven to be an effective method for taking care of stubborn stains in burnt pans. The method is quite simple. You simply need to mix a small amount of water in the warm pan with some detergent. Let it simmer for a while and put it back on the stove to boil for 10 minutes on high heat. Take off the pan and throw away the water. Scrub the insides with a scrubbing pad and rinse. Your pan will be as good as new. Remember, a burnt hot pan needs to be treated with utmost care. So, do not just start scrubbing at it. Start by throwing away any loose bits. One of the easiest ways to get rid of the scorched part off your burnt pan is with the help of baking soda. Once the pan is off the stove and has rested for a while, sprinkle baking soda on the bottom and add water to cover it. Cover the pan and leave it be for 6 to 8 hours before scrubbing it with a scrubbing pan or metal edge. Since carbonated drinks are really acidic, they can break down the burnt areas quite quickly and easily. Just put a cup of it in your burnt pan/pot and let it simmer on the burner for a while. After about 10 minutes, take it off the stove and just rinse the pan/pot with warm soapy water solution. You can also just leave it in the pan rather than boiling it. It will slowly break down the stains, allowing you to scrub the areas easily. Dishwashers are made to clean the easy sauces and stains of food left on your plates and other forms of cutlery. But the real job begins when you have to clean burnt pans. In some cases, it can be quite challenging. Hopefully, you’ll find the above-mentioned guide helpful for cleaning up your burnt pans and pots.